In this article, we’ll talk about the best ways how to clean kitchen cabinets. Don’t worry! You can clean those cabinets with ordinary ingredients in a few simple steps. Whether you have wood, laminate or glass cabinets, we will discuss methods to get those cabinets looking like new again. Do not forget to clean and disinfect your kitchen cabinet interiors and drawers as they need to be cleaned regularly, too. Thoroughly cleaning and disinfecting your cabinets wards off any icky mold and mildew buildup. Bleach is a great disinfectant that is fantastic cleaning. Begin by washing the cabinet’s interior with a solution of soap and warm water. Then rinse your cabinets with clean water. Now, you can begin using the bleach. Mix a solution containing a 1:9 ratio of bleach to water. Before you you begin, put on rubber gloves to protect your hands and open the windows to help with the bleach fumes. Use a clean rag to disinfect the entire interior of the cabinets, including shelves and walls. Drench the rag regularly to optimize the disinfectant properties of the bleach. Next, grab another clean rag and fresh water to rinse the bleach solution from your cabinets. Again, soak the rags frequently to remove all of the bleach. Use a dry cloth to remove any remaining water. You should wait until your cabinets are completely dry before replacing your food items or dishes. To reach those tight nooks and crannies, use a toothbrush with your bleach solution. If you find there is still some extra dirt or grit, use a Q-tip with the solution to get the corners. As we mentioned earlier, your cabinet drawers need cleaning as well. Remove your drawers and their contents. Use the blend of warm soap and water to clean the drawers. After cleaning, you should rinse the drawers. Use the same 1:9 ratio bleach to water solution to thoroughly wipe down the drawers. Rinse the bleach-drenched drawers and remove any extra water with a sponge. Now, simply place the drawer upside down in the sink or dish rack to air dry. If you prefer to use natural cleaning products, mix white vinegar with warm water to create your cleaning solution. The ratio should be a 1:2 blend of vinegar to water. You will still need to rinse and dry the cabinet interior as you would if using bleach or warm, soapy water. A wonderful disinfectant that also happens to be all-natural is apple cider vinegar. Mix the potent vinegar with a quarter cup of hydrogen peroxide and one cup of water. You can even add some essential oil to deodorize your cabinets naturally after the vinegar scent dissipates. Put your mixture in a spray bottle. Lightly apply the blend to the cabinet/drawer interior. Let the surface to dry completely before replacing items. Tea tree is an essential oil that can also serve as a disinfectant when combined with liquid detergent (one-and-a-half teaspoons) and white vinegar (two tablespoons). You will need to add 20 to 25 drops of the oil. Shake the mixture well and apply as you would the apple cider vinegar disinfectant. Small splatters and spills may not seem like a big deal, but you can make cabinet cleaning easier by wiping up minor messes as soon as they happen.It is no secret that the longer we wait before cleaning a room or surface it will only make cleaning them harder later on. Try to do a light cabinet clean on a regular basis. This simple habit will help prevent, or at least decrease, the buildup. Simply wiping the cabinets with an all-purpose cleaner should do the trick. You should try to do a thorough cleaning of your cabinets at least once per year. If you use your kitchen more often, then you might want to do a semi-annual cleanings. During this time, clean both the interior and exterior of the cabinets. It’s also the perfect opportunity to get rid of old foods or items you no longer need. Wood cabinets bring a cozy feeling and appearance to your kitchen, but not when they are covered in grit and grime. Prepare to clean your wood kitchen cabinets by placing the drop cloths beneath them. Mix an even ratio of vinegar to hot water in your large plastic bucket with some drops of olive oil to restore luster. Water and vinegar act to disinfect while also removing grime from your greasy kitchen cabinets. You should always wear rubber gloves to protect your hands from the solution. Drench a rag in the cleaning solution and dive into scrubbing the surface of your wood kitchen cabinets. After cleaning, you may see some lingering areas of grease or remnant food spills. Make a baking soda paste by combining a bit of water to break down these tough areas. Use a rag to apply and rub gently until the spot is gone. Grab another clean rag to dip in freshwater. Wipe the cabinet exteriors to rinse off the solution. Then, thoroughly dry your cabinets with a soft rag. If the baking soda paste fails to remove remnant stains, combine coconut oil to fully eliminate the gunk and grime. Apply the blend on your cabinets with a gentle cleaning brush or soft head toothbrush. Finish the process by applying a wood polish that doesn’t have wax or silicone to enhance the appearance of your cabinets. Use another clean cloth to wipe your cabinets. Do you have painted kitchen cabinets? As with all types of cabinets, wiping away dust or minor messes frequently is a smart practice. Make it a habit to wipe your cabinets after doing the dishes or placing a load in the dishwasher. To maintain the freshness of your paint, only use a soft cloth or sponge for cleaning. These materials provide a powerful clean without leaving behind unsightly scratches. Select mild cleansers and detergents without any bleach or ammonia. Both of these agents are extremely powerful and can remove paint and lacquer from your cabinets. You can even purchase a natural cleanser from a store or make your own natural blend to avoid toxic fumes. Combine baking soda (one tablespoon), vinegar (one cup) and warm water (two cups). Place the blend into a spray bottle for the easiest application. However, you can also use a bowl to hold your natural detergent. Depending on the method you selected, spray the contents onto the cabinets directly or drench a cloth and begin scrubbing. Apply circular motions in areas that require spot cleaning. After rinsing your cabinets, use a clean cloth to dry them. Implementing regular wipe-downs and cleanings will keep your kitchen beautiful for every occasion. Fortunately for you, laminate cabinets are among the easiest types to keep clean. Dust your cabinets every two weeks with a soft rag or customary duster to remove accumulating dirt. 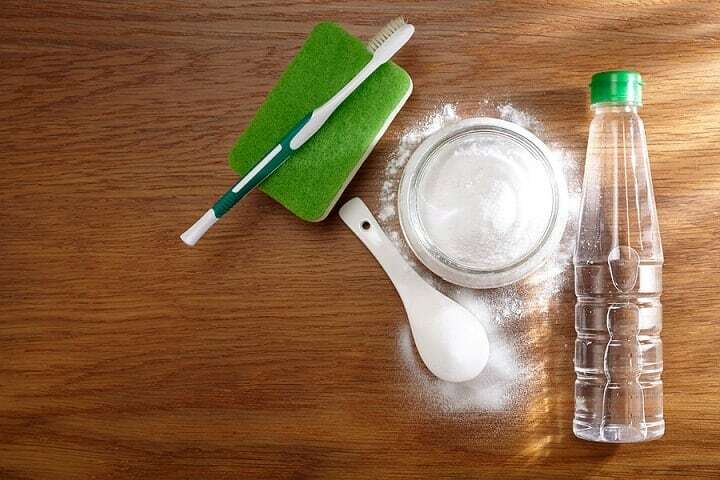 Water should be your first weapon when dusting does not completely clean your cabinets. Place water on a soft cloth and rub the cabinet to try to remove any visible grit or grime. Bear in mind that you should start off with a small quantity of water because when water sits on laminate it can damage the cabinet surface. The next course of action in instances involving very greasy kitchen cabinets should be a mild detergent or hand soap. Use a soft cloth dipped in a solution of water and detergent to apply the cleanser to your cabinets. Let the soap sit a few minutes before rinsing with water. When both water and mild cleaners fail to clean your cabinets effectively, you can purchase a special cleaning solution approved for use on laminate cabinets. Read the instructions so you can dilute the treatment accordingly. This is important because many full strength solutions may permanently damage laminate cabinets. You may discover your cabinets need something different or additional for maximal cleaning, which is why you should feel free to experiment with options recommended to you by a professional or hardware store employee. Metal is a sleek, eco-friendly material for your kitchen cabinets. Regular cleanings with the proper products will keep your cabinets in mint condition. Clean the cabinet interior by vacuuming debris from the shelves, corners and tight grooves. You can get rid of oil, grease and grime from metal cabinet exteriors by placing rubbing alcohol on a clean cloth. Wipe down the surfaces with the cloth containing alcohol. The liquid is ideal for eliminating grease and leaving behind a clean finish. This sturdy material requires delicate wool to get rid of rusty areas. Test clean an area on the cabinet interior to gauge how much pressure you should use. The less pressure you use, the less likely you are to damage your cabinets. To wash metal cabinets, use soap, water and a clean rag. Apply as you would on any other cabinet type. Rinse the cabinets with water followed by drying with a hairdryer. This drying method guarantees all areas of the cabinets are totally dry. The final step is to apply car wax per instructions on the label. A thin wax coat serves to protect the cabinets and makes it easier to clean in the future. While this step is optional, it will make your cabinets shine as if they are new and pristine. Use the same methods to clean glass cabinets as you would other glass surfaces in your home. For daily maintenance and messes, use a soft sponge with soap and warm water. Follow up by rinsing the surface with clean water. Keep your cabinets crystal clear and free of streaks with a solution containing equal parts white vinegar and water. A store-bought glass cleaner containing ammonia similarly cleans with a streak-free finish. If the glass is encased by wood, take care not to get any spray on those areas to avoid damage. However, if you accidentally spray the frame, wipe it immediately. An even better way is to spray the cleaner on your soft rag or paper towels instead of the glass for cabinet doors with decorative wooden. Rub the solution onto the glass, and then dry with a soft cloth. Dark kitchen cabinets are becoming super popular as of 2017. Opting for dark cabinetry will give your kitchen an ultra-luxurious look. The trade-off for this look is they are harder to clean. Dark cabinets can be among the most difficult to clean regardless of finish (matte, gloss, semi-gloss etc.). Any smudges, fingerprints or spills are more prominent on dark cabinets compared to lighter counterparts. Remove residues left by an oily product with a customary household cleaner. Depending on the stain, these cleaners do not always work to wipe away oils. Even if it does, you do not want to utilize a cleaner that will leave residual streaks. Use soap and warm water on a soft cloth to keep from making streaks. You should also only use microfiber rags to minimize the chance for scratches, particularly if your cabinets have a gloss finish. If this method happens to leave streaks, apply window cleaner with a clean cloth. Dark laminate cabinet models can be cleaned with eucalyptus oil and water misted from a spray bottle. 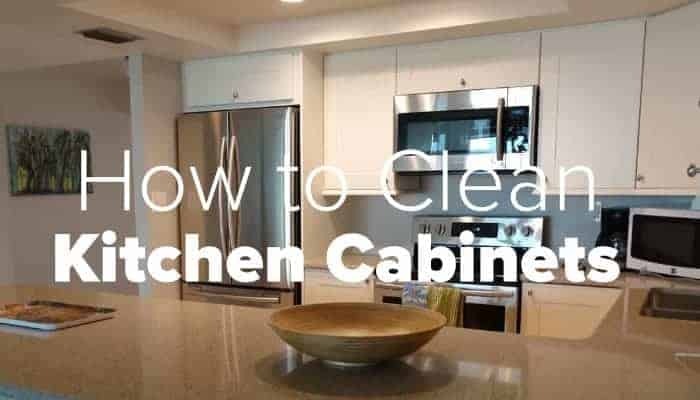 We’ve covered several methods to cleaning your kitchen cabinets. Remember that warm, soapy water tends to do the trick for most cabinets. If you need something stronger, utilize a blend of vinegar and water. And don’t forget to wipe your cabinets regularly after the deep clean to decrease buildup. Happy cleaning!